The gas produced in the biogas plant is used to fire a block-unit heating power plant that co-generates electrical power and heat simultaneously. The heart of the co-generation plant is a 526 kW motor to which generator for producing electrical power is connected. Most of the heat released in the combustion process is not dissipated to the surroundings, but is used to operate the biogas plant and to supply heat to households and businesses in Feldheim. This method, called co-generation (of heat and power) allows a very high level of efficiency to be achieved and is CO2-neutral, since the amount of carbon dioxide released is no more than the amount previously withdraw from the atmosphere by the plants being used. How does the Feldheim local heating network function? About a fifth of the extracted thermal energy is withdrawn in the form of water that has been heated to approximately 90 °C via a heat distribution system (1) and used to heat the fermenter in the biogas plant (2). The remaining thermal energy is fed via a thermal energy recovery unit (3) into the heat distribution centre, where the thermal energy is fed directly into the heat supply network (4); any heat that is not required is used to replenish the heat accumulator (5). The heat accumulator or heat storage unit switches on when the biogas plant is temporarily offline, for example when maintenance work on the co-generation plant is being carried out. If all the customers in Feldheim were to run their heating at full power, heating plants with a total capacity of 1600 kW would have to be available. However, a heating capacity of about 1000 kW is sufficient, especially when one considers that not all customers need full heating power simultaneously. With optimised control of the heat distribution centre, it is possible to reduce the available heating capacity even further. For most of the year, the 400 kW of heat supplied by the co-generation plant is fully sufficient. To ensure that every building stays warm, even on cold days, a woodchip heating plant (6) with an additional 400 kW of capacity is available. During peak loads, i.e. those hours in which demand for heating is particularly high, for example on cold winter mornings, the heat stored in the heat accumulators can also be used. The heat accumulator is then replenished during the remaining hours. If necessary, an additional 120 kW of heating capacity from the biogas plant is also available for a number of hours. In the event of complete failure, a mobile heating plant can also be connected to the heat distribution network. There are several safeguards, therefore, to ensure that the people of Feldheim are always supplied with heat. Local or district heating network? The terms ‘local heating network’ and ‘district heating network’ are used interchangeably. There is no clear-cut distinction between the two. In Feldheim, ‘local heating network’ is perhaps the more applicable term. ‘District heating network’ is used, in contrast, when the thermal energy is conveyed to users over distances of several kilometres. The red lines show the heating line (VL=warm), while the blue lines show the return flow (RL=cold). Water heated to approx. 90 °C is provided via the heat distributor of the biogas plant (1) and pumped via the heat extraction unit (3) to the heat distribution centre. The heat supply network (4) is fed via the heat distribution system (7). Any heat that is not needed immediately is stored in the heat accumulator (5). Only pure water is transported in the insulated piping network for heat supply, indeed in the entire system. To protect the pipelines against calcification, for example, this water is treated accordingly in a water purification plant (8). 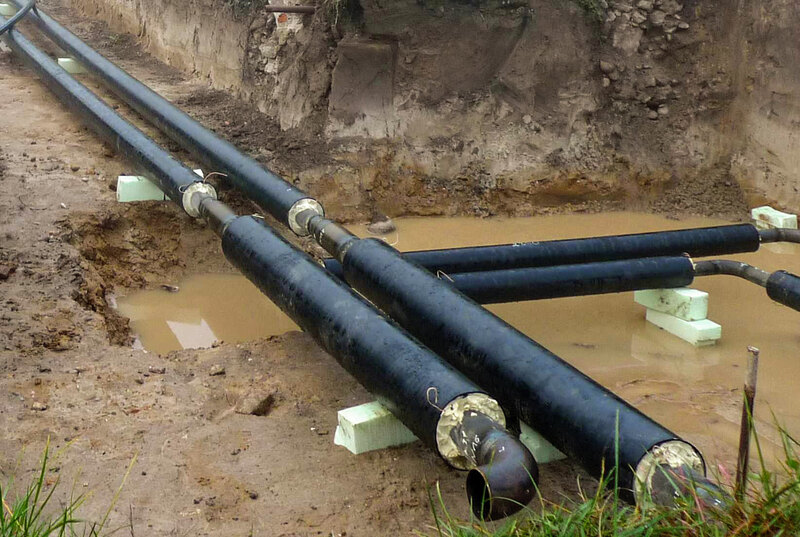 This is done when the system is first filled with water, and thereafter only when water is lost from the piping system, for example from a broken pipe in the distribution network. Any loss of water resulting from small leaks is automatically replenished by the system. This is therefore a ‘closed system’; there is no need for additional water to be continuously added. 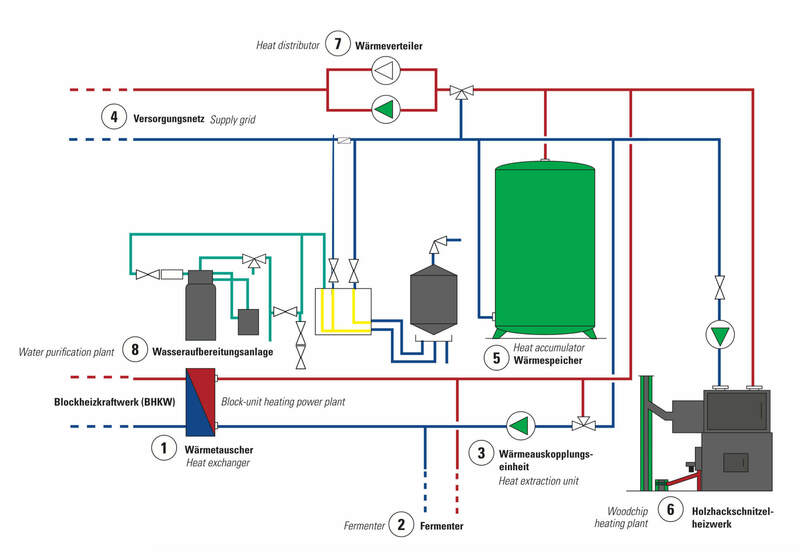 The heat distribution centre accommodates the heat distribution unit (7) to which the biogas plant, the heat accumulator and the woodchip heating plant are connected via the heating pipes and the return flow pipes. Depending on demand, the respective components can be individually brought online or offline. An output-controlled pump system ensures that enough hot water is constantly provided by the supply network. The woodchip heating plant is also connected via the heat distributor. This heating plant is switched on when the control system in the heat distribution centre detects that the biogas plant has not supplied sufficient thermal energy over a predefined period, and that the heat accumulator has reached a critically low level. The control system records and analyses all the data from the individual plants. By constantly comparing actual values against reference values, the entire system can be operated automatically. Every withdrawal point is fitted with a heat delivery station by means of which the thermal energy received from the primary circuit is delivered, in the form of water with a minimum temperature of 80 °C, to the secondary circuit inside the home or building. The water is the primary circuit is cooled in the process to approximately 60 °C and is fed back to the heat distribution centre via the return pipes.